This quote comes from Gary Hamel , a global thought leader who the Wall Street Journal has called one of the world’s most influential business thinkers. As part of a recent Hamel Innovation Academy, he spoke about a company called Quirky that was providing a social platform for innovators to share ideas and new product inventions. Hamel was high on this company for finding a new way of bringing innovation to inventors and to him, nothing is more important than finding ways to unlock innovative thinking. I am a big believer in what Quirky stands for and built a business around. That innovation drives the world and can come from anywhere. Forward thinking company with a young confident and articulate leader committed to building a platform that allows entrepreneurs to share their ideas. Very interesting five year whirlwind run for this company that showed how social media can and will change the product design and development cadence moving forward. Spoiler alert : these guys were rock stars but fell from grace and filed for Bankruptcy Protection in Sept 2015. If some companies are ” too big to fail” then I would suggest ” Quirky is too good to fail “. There are lessons to be learned about the business of crowdsourcing here. Founded in 2010 by Ben Kaufman, a 23 year old entrepreneur with one successful start up already under his belt. He first designed new Ipod accessories branded Mophie that won Best of Show award at Mac World in 2006. The kid who couldn’t pay attention in high school and dropped out of college was just getting started. For Mac World 2007, Kaufman flipped the classroom. Instead of bringing his new innovation concepts to the show, he set up a booth armed with note books and pens encouraging the crowd to invent and design his new 2007 product line up. By the end of the four-day show, using a 3-D printer Kaufman and team had roughed out prototypes of the winning sketches submitted. This was the start of what would become Quirky. Kaufman dubbed it ” a modern invention machine ” with a company motto of ” we make invention accessible “. Kaufman felt great ideas came from the minds and living rooms of every day inventors ( the idea community ) who just needed a platform to make these ideas come to life. What these creators needed were experts who would deal with all the back room stuff required to build out their idea or invention. So the Quirky team set out to build a social platform that made it easy for innovators to share their ideas. Just describe the problem you are solving, sketch out the product / idea that will become a useful solution for consumers and submit it to Quirky for their review ( $100 cost to submit ). Those ideas that Quirky employees felt had the most potential became shared property of the inventor and Quirky. Inventors knew their royalty split if Quirky succeeded in getting the product to market. In 2010, crowdsourcing was not a new idea. Kaufman’s findings at Mac World 2007 under a small sample environment made him a believer in the power of community. How Quirky tweaked crowdsourcing content was to bring expertise to the community generated ideas. Here is Kaufman’s position expressed in an interview with Forbes. Fundamental to that term is the notion that the community is smarter than the experts, that you can do better by just pulling from the community and forgetting about what the experts say. That is not sustainable. It doesn’t work and it creates fatigue within the community and within the company. What we do is both push and pull. We’re feeding the community designs; they’re responding to them. They’re feeding us ideas; we’re feeding them expertise. It’s much more of a conversation, a collaboration, or co-creation. The top line market response to Quirky business model was impressive and Kaufman was seen as one of the lead young entrepreneurs in the social space. Quirky had developed partnerships with leading global brands like Mattell ( toys ) , Harman ( head phones ) and a major collaboration with GE focused on Smart Home Mobile Connectivity. Quirky’s initial fail raises questions on the business metrics of crowd sourced business. The adjustable power strip called Pivot Power was a big commercial success but there were many products with marginal success. The Quirky “ crowd “ is a community of inventors. They may not always be best barometer of mainstream consumer buying habits. Unfortunate for Quirky but lesson learned, that innovation alone does not create market demand. 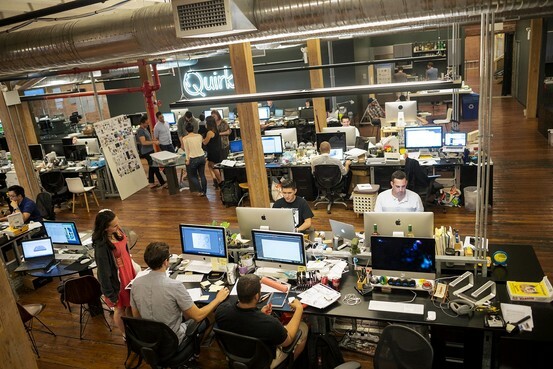 Quirky was profiled in an excellent New York Times article in Feb 2015. The author insight and comments from Quirky’s charismatic leader Kaufman would now seem foreboding. Quirky is or was a very cool platform to encourage people to share ideas. Reality dictates that a business must deliver profit to survive. This is a case where we need a forward thinking leader with deep pockets who has the vision to see what organizations like Quirky have the potential to create. Companies like Quirky can bring real change and add real value to people’s lives around the world. Hope we see Quirky 2.0 soon.